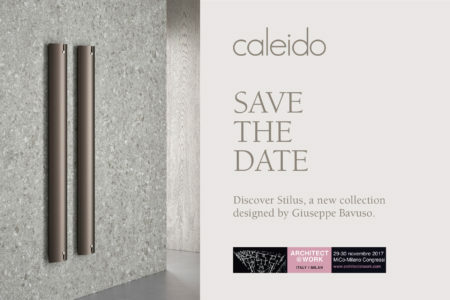 Caleido brings a new perspective to architect@work: Stilus design by Giuseppe Bavuso. With aesthetic elegance and precision, Stilus enriches Caleido’s radiator collection, combining light and heat along with a multiplicity of functions: notably, the floor lamp associated with the heating aspect. The collection is characterised by the synergy of light and heat, used innovatively and with flexibility in different contexts, sustainability (with an emphasis on recycled materials and infinitely recyclable materials), with warm, enveloping colours and calibrated textures, to generate positive aesthetic and tactile sensations. This is a significant new development, and a complete item of furniture that opens up unexpected spaces and visual elements.